ST. GEORGE — Zion National Park has a problem, one that is becoming increasingly common in national parks. Tourists are flocking to the soaring crimson walls of Zion and the valley below in ever-growing numbers, overflowing trails and parking areas, damaging the natural resources and straining the capacity of the park. The park’s chief of concessions and partnerships, Jack Burns, said it took 66 years for Zion to reach 1 million visitors per year. Fifteen years later, he said, the park experienced its first 2-million-visitor year; and 24 years later still, the park reached its first 3-million-visitor year. 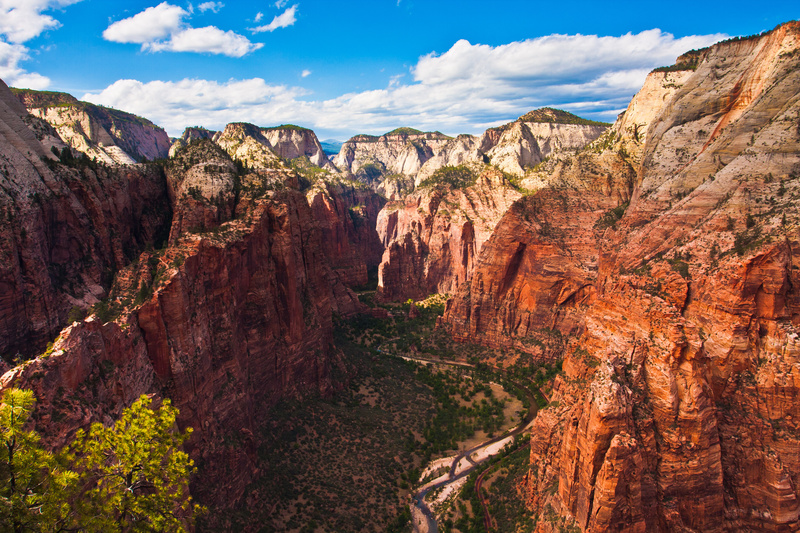 In both 2014 and 2015, Zion saw 3 million visitors annually. Wait times lasted hours. Tourist frustration grew. Some were turned away. 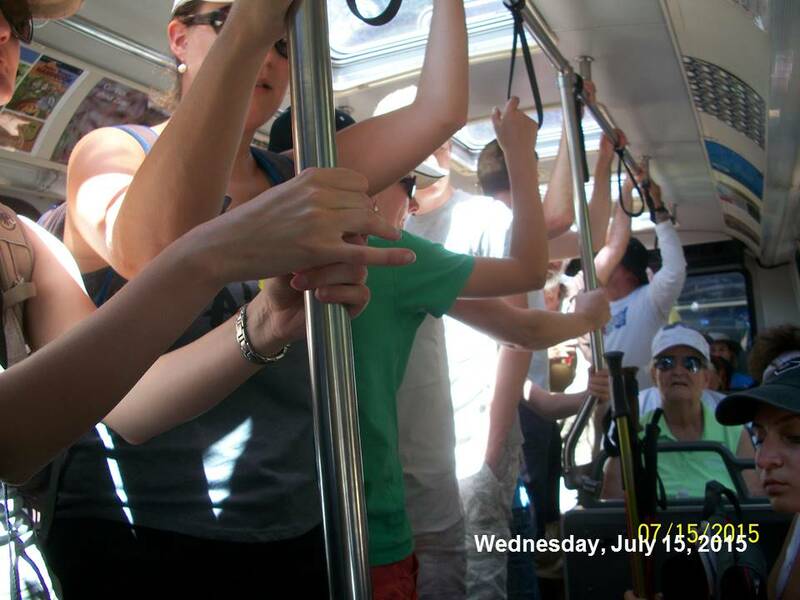 The shuttle service was then reinstated for two weeks longer than normal to accommodate the increased visitation. At a “brown bag lunch” in January at the Springdale Town Hall, Burns gave a PowerPoint presentation outlining some of the problems Zion National Park is facing. 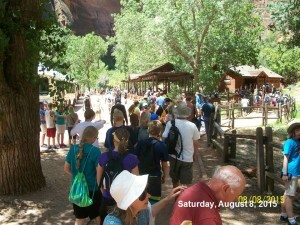 Several pictures showed the extreme crowding certain trails are experiencing, in particular the Narrows and Angels Landing. Park Superintendent Jeff Bradybaugh said answers to the problems are not likely to come anytime soon. The park service first needs to gauge what park capacity is – a process he said will take several years. Several Springdale residents attending the “brown bag lunch” expressed dissatisfaction with Bradybaugh’s answer. Some asked if it would be possible for Congress to enact an emergency decree limiting the number of visitors. Bradybaugh said it is unlikely Congress would take action on the issue. Zion is not alone in the issue of overcrowding. Visitation is up at virtually every national park in the U.S.
Yosemite National Park has been dealing with overcrowding for years. At Arches National Park on Memorial Day 2015, a line of cars extended from the park entrance to Highway 101, a distance of over a mile, forcing the Utah Highway Patrol to temporarily limit visitors. Crowds, bottlenecks and resource damage. Angels Landing and The Narrows, arguably the two most popular hikes in the park, are experiencing severe overcrowding. 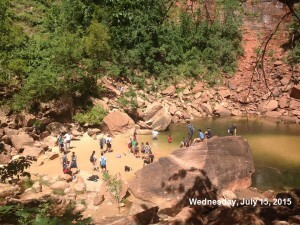 In the case of Angels Landing, bottlenecks form in places where the exposure is severe, creating dangerous conditions for hikers, Bradybaugh said. One possible option is to possibly implement a permit system, Bradybaugh said. Aly Baltrus, public information officer for Zion National Park, said The Narrows is experiencing environmental degradation, especially since there is nowhere for hikers to use the bathroom. As a result, waste is deposited throughout the canyon and never very far from the Virgin River that flows through it. The damage to the park is not limited to the Narrows and Angels Landing. Towns like Springdale that are gateways to the national parks are also experiencing both positive and negative effects from the visitation growth. While Springdale has seen its revenue grow, it has also led to some problems, Springdale Mayor Stan Smith said. While crime has not been as much of an issue, there has been enough of an increase to justify adding an extra officer to its police force. As mayor of Springdale, I have a balancing act that I’m trying to do; there’s a lot of businesses … and families that depend on their livelihood of tourists coming in and spending money. The majority of our money comes from sales taxes. But then I also have the residents that want the quiet, the peace, that don’t own businesses or don’t work there, that settle there for … retirement; they want the peace and quiet. Two of the biggest problems affecting Springdale in the last several years of growth are parking and traffic, Smith said. Parking lots in town are routinely filled to capacity, visitors park illegally along roads and in reserved parking areas. Compounding the problem are huge lines at the park entrance stretching into town, making for difficult driving conditions. “We do have a problem,” Smith said. Some of his constituents have said the answer is for Springdale to stop advertising, Smith said, but that isn’t the answer. 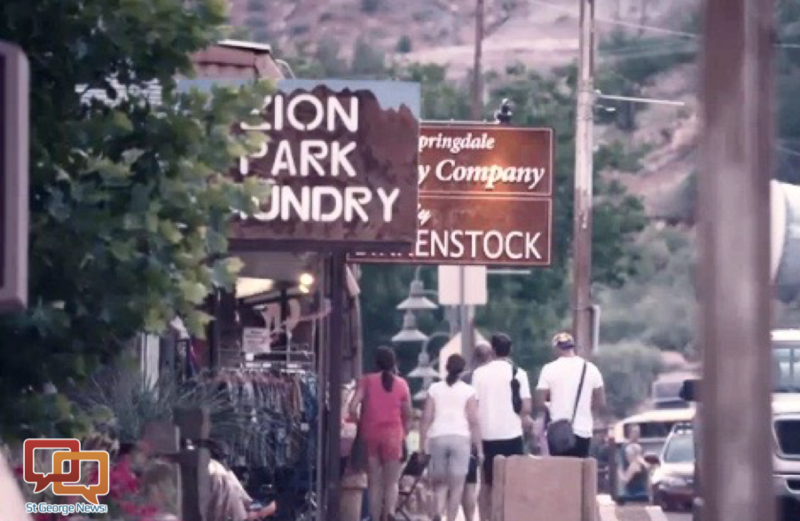 If Springdale was to cease advertising, towns like Kanab and the municipalities around Bryce Canyon National Park would lure visitors away from Zion and Springdale. 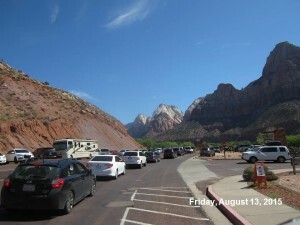 One step Smith would like to see in order to ease the congestion is for the National Park Service to cease the free entrance days during busy holidays. The issue with the free-entrance days is two-fold, Smith said; on the one hand, the parks are giving away vast sums of revenue during the free days, but on the other hand, the parks do not have enough personnel to deal with the overflow – which adds to the problem. An issue specific to Zion is its size, Todd Goss, guide and owner of Paragon Adventures, said. 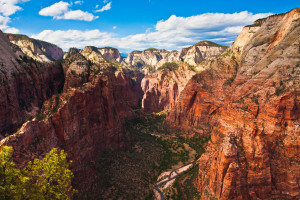 While the national parks seeing similar visitation – Grand Canyon, Yosemite and Yellowstone – are all massive parks where the increased visitation can be spread out, Zion is quite small by comparison. Zion ranks No. 7 in visitation numbers, according to National Geographic. Zion, at 146,592 acres, is by far the smallest of the seven most-popular parks, according to National Geographic. By comparison, the next smallest of that group is Rocky Mountain National Park, with 265,769 acres, almost twice the size of Zion. The largest, Yellowstone, is over 2,200,000 acres. 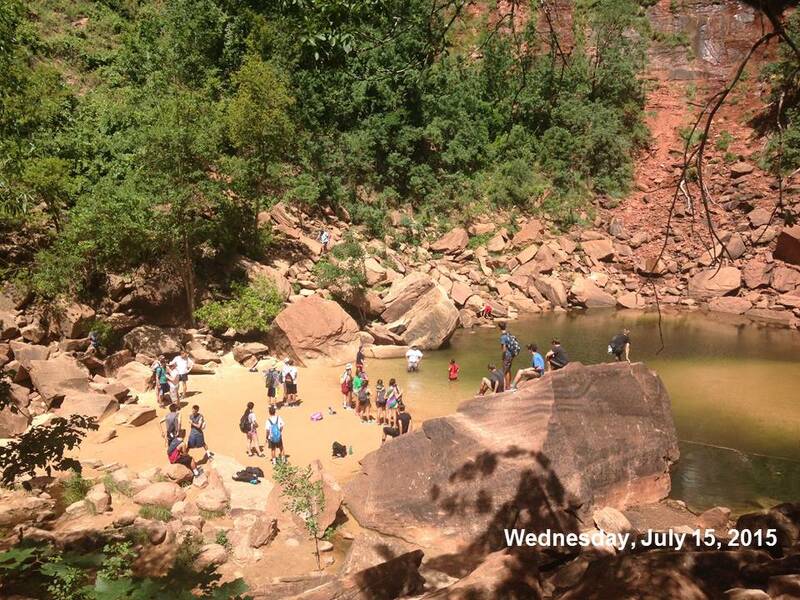 Compounding that problem, Goss said, park staff do little to divert the crush of visitors in the main canyon to the less-crowded sections of the park such as Kolob Canyons, the Kolob Plateau and the east side. Baltrus agreed with Goss’ assessment that Zion is unique in its size. The overcrowding has had a direct affect on Goss’s guiding company. Clients are not looking for the type of experience that Zion now provides, Goss said. They didn’t come to Utah to stand in crowds more associated with downtown Manhattan, which is what Zion is starting to resemble at times. We’ve been running shuttles in the peak of the season every four to five minutes, and each of those shuttles carries 68 people sitting down. Sometimes over 100 standing, every four minutes. You can imagine the capacity in the main canyon. 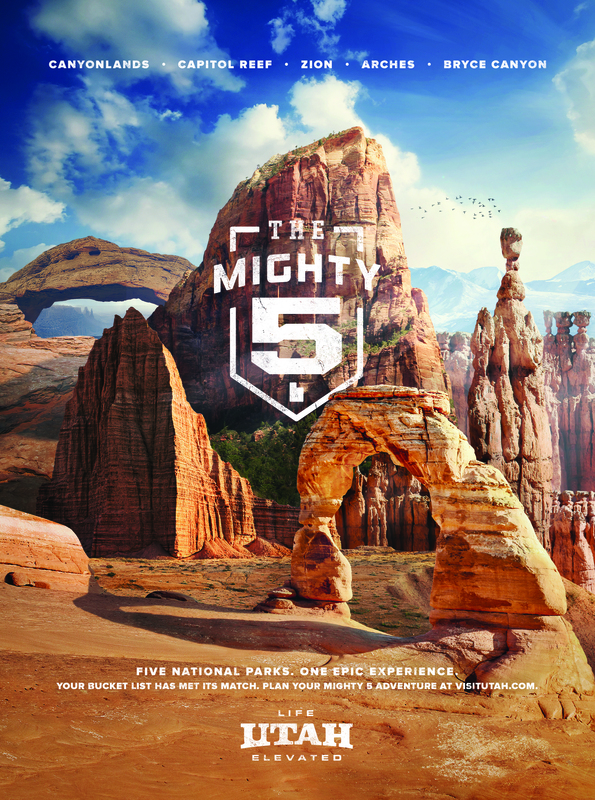 Mighty 5 advertising flier | Image courtesy Utah Tourism Office, St. George News. 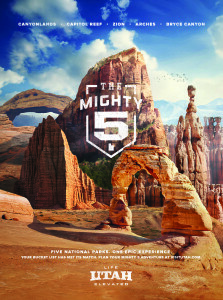 The Utah Office of Tourism embarked on the “Mighty 5” ad campaign in the spring of 2013. The goal of the campaign was to create a call to action and make Utah’s natural wonders — in particular its national parks — stand out from neighboring states, Vicki Varela, managing director of the state’s tourism office said. The campaign has not only pushed visitation figures higher for its national parks, but Utah’s state parks as well. 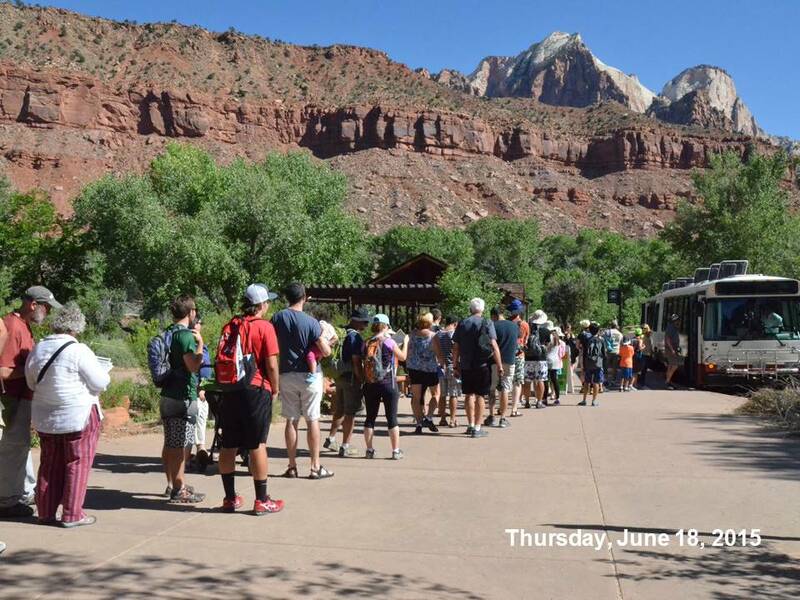 While the national parks in Utah experienced a 14 percent increase in visitation since the beginning of the Mighty 5 campaign, Varela said, the state parks themselves saw a 19 percent increase. Increased press coverage of Utah’s natural wonders will likely add to the visitation numbers. A recent article by Fodor’s Travel named Utah its top travel destination in the world. “Hiking the red-rock canyons of southern Utah’s ‘Mighty Five’ national parks — Zion, Bryce Canyon, Arches, Capitol Reef, and Canyonlands — may change your life,” the Fodor’s article said. The responsibility of the Tourism Office is multifacted, Varela said. Not only is it responsible for promoting tourism and visitation, its personnel are obligated to listen carefully to concerns of the various entities directly influenced by that influx of visitors. National parks, hotels, restaurants and all the other service providers have a say in the decisions of the Tourism Office. St. George Area Tourism Office Director Roxie Sherwin said the “Mighty 5” campaign has had a noticeable affect on area tourism. We have been kind of addressing that for several years, in the way that we market the shoulder seasons (spring and fall) more. We started pushing more visitation January, February, October, November, December. We started marketing to countries that are on opposite schedules as we are, like Australia – their summertime is now …. We’ve also started marketing other things to do besides the national parks. Another issue facing every national park is that while growth has continued unabated, the budgets and staffing of parks has remained stagnant. Park employees are forced to take on more tasks in the same amount of time. Varela said the Utah Office of Tourism would like to advocate in Washington D.C. for an increased budget for the national parks. While most tourists still report a positive experience in the national parks, in Zion, complaints about the crowds are becoming more frequent. The positive aspects of growth are felt in a ripple effect by areas surrounding Zion. In a report released by the park service in April 2015, the local communities surrounding Zion National Park benefited by $233,123,400 in 2014. In the same period, 2,423 jobs were supported by tourism. Thirty percent of those tourism dollars went to lodging; twenty percent to food and beverage; close to 12 percent to gas and oil; ten percent to admission and fees; and other expenses totaled around 10 percent. There was a study done by Southern Utah University. The survey was to visitors to Arches, Zion and Bryce Canyon. Ninety percent of respondents were overall or very satisfied with their visits. We also have a national study … their results show that 85 percent of nonresidents were extremely or very satisfied and 89 percent of Utah residents were extremely or very satisfied. As a local resident and long-time fan of hiking and recreating in Zion, I am one of many who has been bothered by the huge increase of visitation that Zion has received over the past few years. While a variety of management suggestions have been made in response to this influx, I have to negatively respond to the suggestion of utilizing a permit system. Permit systems seem to work well in enabling the wealthy to go on once a year trips that they can plan a year or two in advance. However, the prohibitive costs associated with permits prevent those of us with lesser means, such as college students, from being able to enjoy our natural resources. Additionally, and perhaps more importantly to me, permit systems tend to bar locals from enjoying the resources that they were once able to enjoy. Let me elaborate. As a current resident of Cedar City, and previously St George, my wife and I, along with our friends, enjoy being able to take spur of the moment trips to Zion on our days off. Often these trips are made with no planning, or with only a few days of planning. I believe that many locals visit Zion in a similar manner. After all, for many residents of Southern Utah, the proximity to Zion is one of the reasons that we live here. If a permit system was put into place, it would likely fill up months or even years in advance, as it does in places like the Grand Canyon, and I know that at least for myself, visits to my favorite national park would become a thing of the past. So the question becomes, if we don’t use a permit system, what else could be done to limit visitation in Zion. I suggest a simple, yet radical idea. Eliminate the shuttle system for everyone except persons with disabilities, who would not be able to access Zion on foot, and close the road that goes from Canyon Junction to the Temple of Sinawava year-round. If you want to hike Angel’s Landing, great. You can walk to the base of the trailhead, as well as hike to the top. Make people work for the views and vistas. If you want to hike the narrows, add a couple of extra miles to your trip to hike from the Temple to Springdale. If this idea is too extreme, consider this as a compromise. What if a permit system was put in place, and the shuttle remained open, but only for the disabled, and a select few who had a permit. At the same time, the roads could be left open to foot traffic for those who wanted to hoof it into their favorite spots.